Brighton photographer. Marmery was born in Brighton in 1898 and was the only son of Horace Julius Marmery, who had been born in 1864 or 1865 at Blackheath in Kent, and Lucy Hannah Marmery (formerly Parker), a Brightonian. Lucy and Horace married in 1893, and their only daughter, Eva Dorothy Marmery, was born at Brighton later in the year. In 1901 the family were living at 17 West Hill Place off Buckingham Road in Brighton and Horace had begun working from home as a photographer. By 1911, however, he had become a lamp lighter, and had moved with his family to 18 North Road in Brighton. Eva had started work as a typist. Brighton Directories record that a John Marmery lived at 11 West Hill Place during the First World War and in the 1920s. It is not known whether he was a relative. Towards the end of 1924 Sydney Marmery married Daisy Baker at Southwark. By 1929 he was living at 25 Barnett Road in the Hollingbury area of Brighton, and he was still at this address in 1936-37 (Pike's Directory). It is not known whether he and Daisy had any children. Marmery published good quality black and white real photographic cards with narrow white borders and captions written in small, neat, plain capitals. His cards are now difficult to find, which may indicate that they were offered for sale only in a few shops, perhaps just for a brief period. They evidently date from the 1920s or 1930s, but only one smeared 1920s postmark has been found. A card of St Marys at Bramber has Marmery's name and the address "12 West Street, Brighton" printed on the back. Late 1920s and early 1930s Directories list Lloyds Photographic Materials Ltd. at 12 West Street, but whether Marmery was the proprietor or a partner in the firm has not been determined. By 1933-34 it had moved to 74 Kings Road. 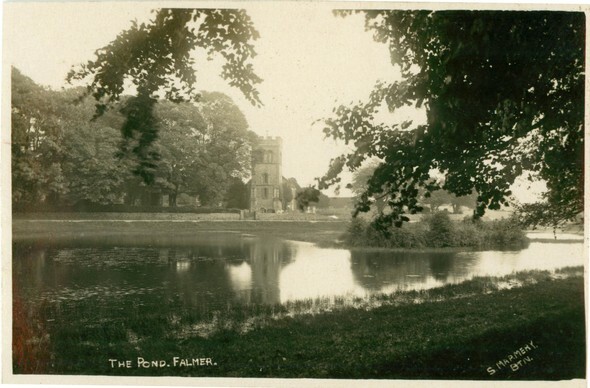 A card of Falmer Pond has Marmery's name in the corner of the photograph, but does not give an address. Perhaps, by this stage he no longer had any connection with Lloyds, and was working from his home address, which he wished to keep private. Marmery is said to have also published sepia real photographic cards of Herstmonceux.